Day 1 : Assembly @ Kothrud (Neeta Travels office) @ 05:30am. Depart by Volvo (Ac) to Bandra Terminus. Board Paschim Express (12925) @ 11:35am. Day 2 : Arrive H.Nizamuddin Station @ 10:00am. Freshn’p @ Comesum and breakfast. Proceed to Rishikesh (220kms/6-7hrs). Arrival at Campsite (Aspen Adventures) at night around 21:00hrs. Inclusion: Dinner and O/N stay @ Campsite in tents. Day 3: Morning Exercise followed with White Water Rafting from Marine drive – Shivpuri (11 kms / Grade 1 and Grade 2/3 Rapids). Rappelling and Rock Climbing in the evening. Campfire @ night. Inclusion: Morning Tea, Breakfast, Lunch, Snacks, Dinner & O/N stay @ campsite. Day 4 : Post breakfast, leave for half day Trekking & Jungle Cooking enroute. Evening team building activities and overnight stay. Day 5 : Morning Exercise followed with White Water Rafting from Shivpuri – NIM (16 kms / Grade 1 – Grade 4 Rapids) followed with Body surfing and Cliff Jump (25 ft.). Beach Volleyball/Throwball competitions and team building games. Day 6 : Packup followed with breakfast & Packed lunch. Proceed for Bungee Jumping & Flying Fox @ Jumpin Heights (India’s only extreme adventure zone). Evening visit @ Ram Jhula for Ganga Arti and shopping. Proceed further for H.Nizamuddin railway station. Inclusion: Morning Tea, Breakfast, Lunch and Dinner @ Chotiwala. Day 7 : Arrive @ 06:00am & Board (12904) Golden Temple Express @ 07:30am. Day 8 : Arrive Mumbai Central @ 05:20am. Proceed to Pune by Shivneri Volvo. TOUR ENDS! 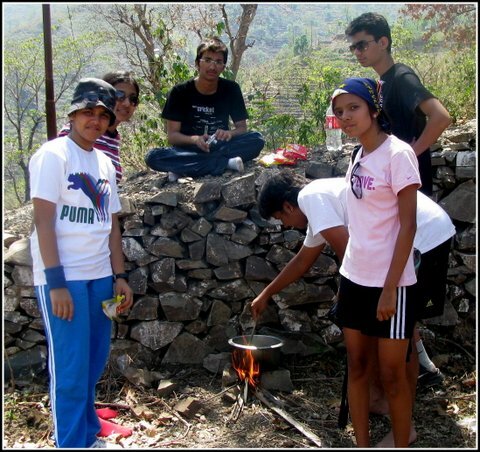 kolhapur Campers = Rs.16,500/- per head. Mumbai Campers = Rs.15,000/- per head. Pune Campers = Rs.15,500/- per head. Payment can be done by cash . 1. Sleeper Class Train fare from Mumbai – H.Nizamuddin – Mumbai. 2. Ac Volvo travel from Pune – Mumbai – Pune. 3. Pickup & drop, internal transfers & sightseeing for 05 days in Ac Tempo Traveller. 4. 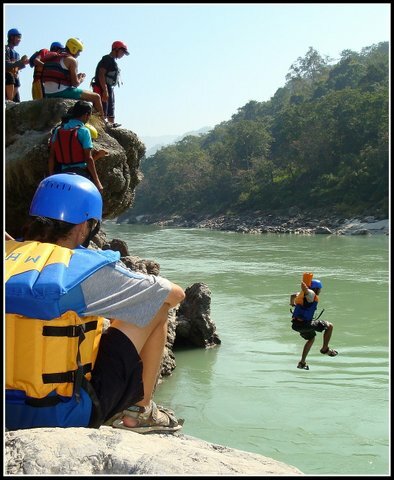 White Water Rafting for 2 Days with all safety equipments. 5. Adventure Activities such as Trekking, Rappelling, Rock Climbing. 6. Four nights stay in Luxurious tents on twin sharing basis with attached toilets, bathrooms & electricity. 7. Four Breakfast, Four Lunch, Five Dinner, Three evening Snacks @ Rishikesh campsite. 8. One Senior Outdoor Expert for a Group of 15pax and Two Instructors from the Campsite. 1. Meals during Train/Bus Journey from Pune -Mumbai – Delhi – Mumbai – Pune. 3. Any other meals besides mentioned in the inclusions. 1. Bungy Jumping : Rs.2,500 + 200 (Ac Transfer by Bus from Laxman Jhula to & fro) + 100 (Entry Ticket) = Rs.2,800/- per person. 2. Flying Fox : Rs.1,500/- per person. • Cancellation charges – Cancellation charges will be applicable after the Receipt is issued and will cover all situations such as injuries, sickness, exams, interviews, selection in tournaments etc. 1. Immediate Cancellation within 05 days after receipt being issued – 10% deduction. 2. 30 days before prior departure – 25% of the Tour Cost will be deducted. 3. Between 15 – 30 days – 50% of the Tour Cost will be deducted.